"This 'secret' recipe has been in the family for years. If you promise not to tell, I will share it with you! The ingredients may sound strange and at the beginning it smells kind of funny, but just you wait!!! Wow, is it good!" On top of a double boiler, beat together the egg yolks, vinegar, sugar, mustard and salt. Cook over medium heat until mixture becomes thick. Remove from heat. Add the marshmallows to the mixture and stir until dissolved. Whip 1/2 pint of the whipping cream until soft peaks form, and then fold it into the cooked ingredients. If mixture is too thick, thin it by adding a little cream or fruit juice. 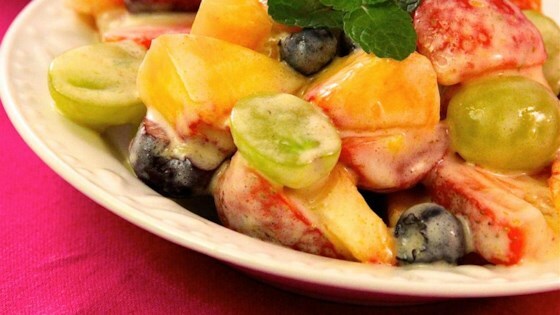 Add to your favorite fruit salad and use enough dressing to make it the consistency you desire. Store dressing, tightly covered, in the refrigerator for a week or so. Wonderfully different dressing recipe. If you're tired of the same old yogurt, mayo, or whipping cream dressings, you have to try this! Great recipe, Sheila! Wow! My tastes must sure be different, because I didn't care for this at all. All I could taste was vinegary mustard. I won't be making this again. This is absolutly delicious. All my friends beg me for the recipe. I'ts true, it is like no one else's and it is great! Makes my fruit salad extra special. This is a wonderful dressing for fruit salad. A real change from yogert or mayo. We found it to be delicious. My fruit salad dressing is exactly like this except we don’t add mustard. I made it and the taste was different and good. The texture was not what I was looking for. If I make it again I will not refrigerate it first and immediately serve it in the salad.